For more than 12 years, Lee Carroll has channeled the messages of KRYON. These messages are ones of hope, empowerment, harmony, peace and goodwill and explore the complexity of human relations from the individual personal/interpersonal to the national/global, political, economic and ecological. From the beginning in Book 1, the message has been that we are in a period of great changes – changes that have been predicted by many of the world’s religions and predictive personalities such as Cayce, Nostradamus, and others. The qualifying difference in these communications is that since 1987, there has been a major shift in consciousness – human consciousness – on the planet. This shift has altered the validity of these predictions. The changes we now face are challenges to old paradigm thought forms, belief systems, and practices. 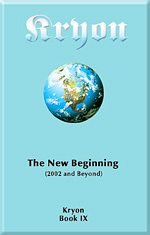 Passing The Marker (previously reviewed in our Angels, Nature and Humanity series) explores the new energies now available to humanity, while The New Beginning: 2002 and Beyond helps one to understand our current turmoil and crises as the “old energy” is released and the “new energy” is invited in. The answer lies in this powerful collection of commentaries, poems and sayings by some of the greatest thinkers of the past twenty-five centuries. The thoughts given voice in this collection cut across a wide range of historical eras and cultures. Speaking the universal truths about the Human Experience, and opening the way to receiving not only guidance from our ancestors, Dr. Dyer explains how we can apply these teachings to our everyday lives – opening the way for expressing our own individual greatness. Another thought-provoking presentation by Wayne Dyer. This is a beautifully crafted, compact book, Dr. Dyer presents ten principles to success and inner peace, which, if mastered and practiced on a daily basis, will also guide to this experience of a “sense of tranquility”. For those who consciously decide to Walk the Path of Inner Peace, these ten “secrets” will help develop your own “inner guidance system”. Drawing from a variety of spiritual traditions, especially the well-known prayer of St. Francis of Assisi, Dyer provides assistance in shifting from the day-to-day challenges of the mundane world and to awaken to the divine within. The first part of the book draws on the words of Patanjali, a Yogi mystic, whose teachings focus on the infinite and eternal Spiritual Force which permeates all, and lays a foundation for spiritual problem solving. The second part of the book, which is organized around the prayer of St. Francis – “Lord Make Me An Instrument Of Thy Peace” – contains specific suggestions to help readers put spiritual problem solving into practice. St. Francis’s legacy is one of love, harmony and service, and putting our energy toward what we are FOR instead of what we are against.